What Is The Real Level Of Unemployment In Germany And Japan? 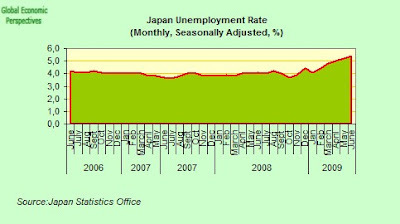 With Japan having general elections today and Germany facing them next month, I though now might be as good a time as any to have a look at a topic which could turn out to be very important in the months to come: the real underlying rate of unemployment in both these countries. While the present focus of most press attention is on the fact that GDP in Germany and Japan nudged upwards between April and June (over Q1), we should never forget that this increase follows substantial falls in output. Japan’s real GDP fell at a record pace in Q4 2008 and Q1 2009 (annualized declines of 13.5% and 14.2%, respectively), and German GDP fell by a quarterly 3.5 percent in Q1 and an annual 6.7% - making for the fourth consecutive quarter of negative growth. In both cases the fall in output was accompanied by only a much more moderate decline in employment. Part of the explanation for this recent return of both economies to growth lies in the fact that both countries have very substantial stimulus and employment protection programmes in place, and these to some extent mask the extent of the output slump. At the same time both countries have been in run up periods to national elections, while both of them have rapidly ageing populations, rising health and welfare costs and steadily deteriorating gross debt to GDP positions. It is therefore highly likely that the positive stimulus programmes will wane somewhat after October as both governments are forced to move from very expansionary fiscal positions, to more or less "belt tightening" ones, and the big issue which lies in front is estimating just how far the respective labour markets can deteriorate in the two countries as a result. Fortunately analysts at Nomura (for Japan) and Societe Generale (for Germany) have recently produced what are very timely studies which help us get a better appreciation of the true underlying situation. Apart from the temporary relief which came from a headline GDP growth reading in the second quarter, the news coming out of Japan at the moment is almost uniformly bad. The unemployment rate is now at a record high, raising even more doubts about the real sustainability of the recent economic recovery. The jobless rate rose to a worse than expected 5.7 per cent in July, up from 5.4 per cent in June. 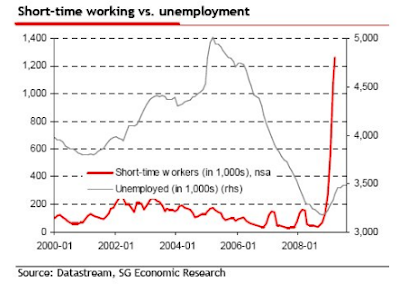 By Spanish or Latvian standards this may seem very tame, but if you take into account the extent of government subsidised "hidden unemployment" the true underlying rate may be nearer 12 or 13%, or at least this is what analysts at Nomura (see below) have recently been arguing. In addition, Japanese core consumer prices fell at the fastest annual pace on record in again in July, potentially putting pressure on a reluctant Bank of Japan to rein in deepening deflation. Core consumer prices - the bank of Japan's preferred measure - which exclude volatile fresh food prices but include oil costs, fell 2.2% in the year to July. Average monthly Japanese household spending fell in July by a price adjusted 2.0 percent from a year earlier to 285,078 yen, down for the first time in three months, while Japan’s July exports fell 1.3 per cent on a seasonally adjusted basis from June, a real big deal this in a country whose economy is almost entirely dependent on exports. Shipments in July fell 36.5 per cent by value year on year, outpacing the 35.7 per cent decline in June. Under the Japanese employment protection scheme, the government pays two thirds of the wages of workers in certain specified situations. 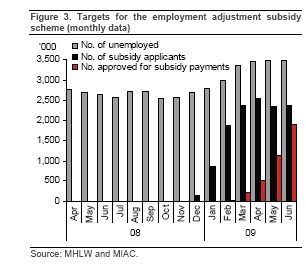 As of June 2009, some 2.383mn workers had applied for employment adjustment subsidies for 2009 onward (see chart). Although only 1.891mn had been approved as of June, Nomura expect this figure to eventually rise closer to the number of applicants. 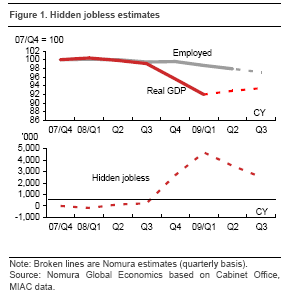 In order to try to get a measure of the impact of this scheme on the unemployment level the Nomura analysts did a number of tests, and found that when indexing the number of those employed and real GDP to the output peak of Q4 2007 there was a considerable gap between the output adjustment and the employment one. Based on a simple calculation which assumed this "gap" to offer a good proxy for the amount of “hidden underemployment”, they arrived at a figure for “hidden jobless” in Q1 2009 of 4.7m. This number is far higher than the June unemployment figure of 3.48m. If the hidden jobless are included together with the registered “unemployed”, they calculate that the unemployment rate would have leapt from 5.4% to 12.2%. 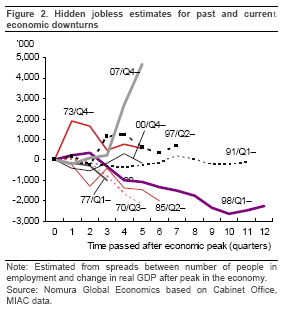 This chart below shows estimates made by the Nomura analysts of the extent of hidden joblessness during previous economic downturns. In the majority of cases the number of hidden jobless did not rise at all, or employment fell by more than GDP did, suggesting that employment adjustments were quite swift. They did find, however that there was a comparatively large rise in the numbers of hidden jobless in Q4 1973, triggered by the first oil shock and in Q2 1997, following the Asian currency crisis, problems in the Japanese financial system and a consumption tax hike. The number of hidden jobless, estimated at about 4.7m in Q1 2009, seems to be well above the figures associated with these two earier downturns. 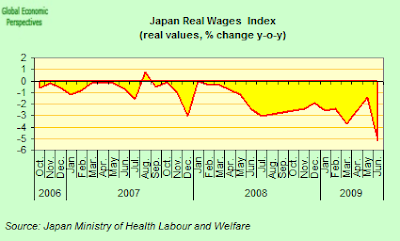 However, as the Nomura analysts point out, even if the difficult labour market conditions are not fully reflected in the unemployment figures, a deterioration in adjusted labor supply-demand could easily lead to major declines in wages even while companies keep the number of hidden jobless down by means of government support. 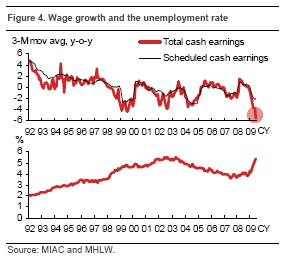 In fact, according to Nomura it would be hard to explain the fact that the decline in wages (total cash earnings of full-time employees) in H1 2009, at 4.7% y-o-y, was far bigger than the equivalent declines in annual average wages of 2.3% in 2002 and 0.4% in 2003, when unemployment also reached new highs, if you don't take the hidden jobless factor into account (see chart). Thus the resulting pressure on wages and household income could easily become a serious impediment to any genuine fully fledged economic recovery. As of June 2009, payments under the government's subsidy scheme for employment adjustment totalled ¥101.14bn. If the number of approvals grows to meet the number of applicants, Nomura estimate total payments will increase to ¥127.42bn, placing additional strain on fiscal finances. The Nomura analysts argue that dividing the cost of the hidden jobless and in-house unemployed between companies, households and government could well represent a major policy challenge for the new Japanese administration when it assumes office. 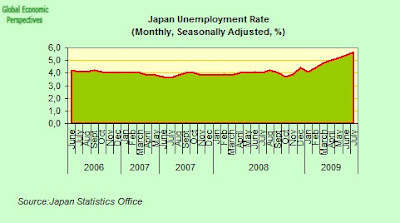 Given the seriousness of the social and political problems that result from sharp rises in unemployment, it is quite possible the next Japanese government will strengthen the employment adjustment subsidy scheme by, for example, further relaxing its terms and conditions, and it is rather unlikely to try to limit the number of eligible cases by tightening conditions. The net upshot of this, will, of course, be a further deterioration in Japan's gross debt to GDP position. Given this, and despite the distortions being produced by the huge number of hidden jobless, Nomura think the unemployment rate is unlikely to be allowed to rise too far beyond 6.0%. We will see. Despite some small improvement in headline GDP numbers, the great German job machine effectively ran out of steam last autumn, and since that time the German economy has been adding jobs at an ever slower pace. Now the rate of job creation has turned negative, and less Germans are employed every month than they were a year earlier. German unemployment rose again in July. The number of people out of work increased 52,000 to 3.46 million on an unadjusted basis. The seasonally adjusted total actually fell by 6,000, according to the statistics office due to statistical changes. Without the impact of the changes, the office estimates unemployment rose by 30,000. 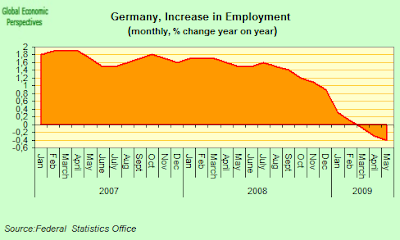 German unemployment began to increase in November after falling steadily for more than three years. The seasonally adjusted jobless rate was unchanged at 8.3 percent in July. Analysts at Societe Generale, have examined the case of the German employment protection programme, and point out that while official unemployment in Germany has in fact only risen moderately in the current recession the underlying real effective rate is much higher. The unemployment rate (using the ILO measure) has risen by just 0.6ppt from its 7.1% low in Q4 2008, while in the euro area as a whole, the rate is up by 2.2ppt to 9.4% from its March 2008 low of 7.2%. As they say, it is also quite clear that this relative stability owes much to the widely-used practice of so called short-time working (Kurzarbeit). 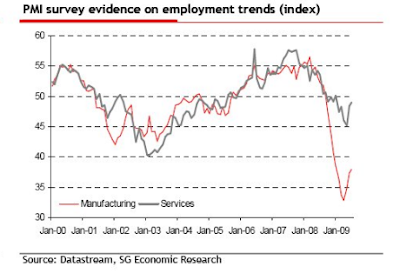 The Societe Generale interpretation is broadly supported by survey evidence which suggests that the rate of contraction in employment has eased, suggesting there will be an even slower increase in unemployment in coming months. For example, the employment component of the PMI survey in manufacturing industry rose to 37.9 in July from a low of 32.9 in April, and in the services sector to 49.0 from a low of 45.2 in May. Employment intentions (in the European Commission survey) have also come off the lows in all sectors, but still remain in negative territory, implying further job losses. This evidence tallies with other recent evidence from official unemployment data, which show unemployment up by an average of 8,000 per month in May-July, a big shift downward from the average monthly increases of nearly 60,000 in Q1. This level of improvement will, according to Societe Generale not be sustained, although they do not expect to see a return to the pace of unemployment gains witnessed earlier this year. Of course, as SocGen point out, company employment intentions could easily deteriorate again if growth expectations get revised down, but for the nearer term, the evidence suggests that unemployment in Germany will rise at slower rates than observed earlier this year. On the other hand they also underline that such short-time working arrangements evidently have a "sell by" date, and can't run forever. As a result there is some concern that a major increase in unemployment in Germany is merely a matter of time. In fact the Societe Generale analysts are not that convinced by this line of argument, since they think that German legislation has already extended the period for which companies can run short-time working from 18 to 24 months. Examining in detail the evolution of the numbers on short-time working they find that the vast majority of companies only resorted to the programme in the very recent past, so that the 24 month limit will not bite until late-2010. Until the turn of the year 2008/09, the recourse to short-time working was very small indeed. 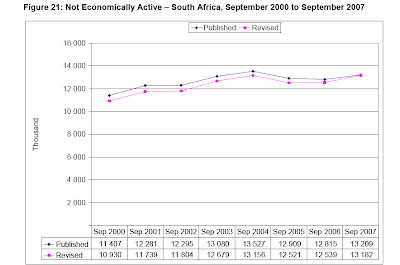 Aside from the seasonal increases in the first quarters of 2007 and 2008, the numbers were small at around 50,000. To put the number in context, they point out that this represents 0.1% of the labour force and is equivalent to the monthly gains in unemployment that were recorded this year. Since then, the numbers resorting to the programme have indeed exploded and by March of this year (the latest available data), there were 1.3 million workers with shortened hours, and this number has probably now risen to around 1.4 million. 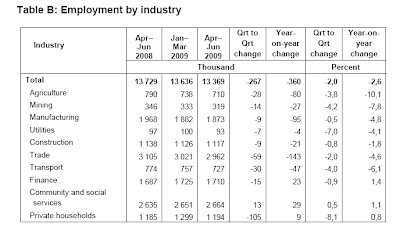 These are clearly big numbers, amounting to about 3% of the labour force. If they were added to unemployment figures, total unemployment would rise to the previous historic peaks of around 5 million. However, given that this increase only began in the final two months of 2008, these schemes could easily run for another 18 months, at least as far as the administrative rules are concerned. Whether the German fiscal position will allow this once the new government is installed is another question entirely. Indeed, according to an article in the Financial Times last week, Germany faces a potential wave of corporate restructurings just after the elections, restructurings which will involve substantial job losses and which have not been announced previously due to the existence of an implicit "pact" not to announce big job cuts ahead of the September 27 ballot. We will, as they say, see the proof of the pudding here in the ultimate eating, but levels of German fiscal support at the present level cannot run for that long unchecked after the election results are announced. Has Spanish Unemployment Really Been Falling Recently? In this post I would just like to ask a very simple question. 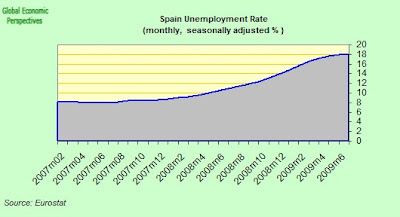 What is the real rate of growth of unemployment in Spain? Are things improving, getting worse, or simply staying the same? Now, before you jump to too many conclusions on this it is important to remember that in the world of economic analysis there are lies, damn lies, and then there are press releases. So if you read in the headlines in your paper recently that the number of jobless in Spain fell by 20,794 in July after a 55,250 decline in June (cutting the total number of unemployment benefit claimants to 3.54 million), you might like - bearing in mind what I have just said - to ask yourself what else could lie behind such statistics? Well, if you look at some of the more informed commentary - say Reuters writer Paul Day - you will also note the little detail that "A huge public works programme in Spain slowed further layoffs in the beleaguered construction sector and helped unemployment claims to fall for the third straight month" - as a result of which the picture you have in your head may start change. In fact, in the first six months of 2009, the Spanish government poured some 5 billion euros into local infrastructure projects as part of a total state-funded public works package worth up to 11 billion euros. Then you might notice the quote from PNB Paribas's Diego Fernandez -"'Keep in mind these figures are distorted by the fact that people taking state funded, back-to-work training courses are not counted"
But there is another little detail you should never forget, particularly in a country that has a lots of seasonally related employment, like construction, agricultur and tourism, and that is the lack of seasonal adjustment in the data. It is normal for unemployment to weaken somewhat in the summer. So if we look at the Eurostat data - scandalously Spain doesn't give a monthly unemployment rate to the public, and much less a seasonally adjusted one - we find that unemployment has gone up steadily from month to month, even if the rate of increase has weakened. The number of unemployed has now gone up every month since May 2007 in my Eurostat datasheet. That is 27 consecutive months of increase. And just wait till we get to the autumn! "Los datos de la EPA no se revisan. El INE hace una encuesta posterior para evaluar la calidad de la EPA, pero no hay revisiones. El incremento de las cifras del paro es muy preocupante, sobre todo porque pasaran varios trimestres hasta que se estabilicen. Y las cifras de paro registrado no contradicen en nada a las de la EPA." (Basically, the survey data is not subsequently revised). Which is very very strange, since the data which are supplied monthly to Eurostat are being continually revised with every passing month at the moment (first up in March, and then down again, the current March reading is 17.2%), which is very acceptable, since seasonal corrections must be difficult at the moment, but it would be nice to have an explanation, since otherwise we might be lead to think that the EPA numbers shot up in March so the INEM numbers for April and May would come down, which they did. And those of us with really bad minds would remember that there were European elections in June. It would be ridiculous to suggest that these numbers were being massaged simply to give the impression unemployment was coming down, wouldn't it? But as I say, the underlying seasonal trend as reported to Eurostat (but not revealed to voters in Spain) have continued to climb. Only in a country where the generally understanding of statistics is low could this happen, and pass un-noticed. On the other hand, the rate of annual increase in the INEM numbers is definitely slowing - or if you prefer the second derivative has turned south, and the annual rate of increase has fallen back from a peak of 56.69 in March to 46% in July - which is hardly surprising since unemployment cannot go up exponentiallly (or there would soon be no one left working) and is also what you would expect to find when manufacturing is contracting less slowly, and significant numbers of people are being employed on public works or going on training courses. 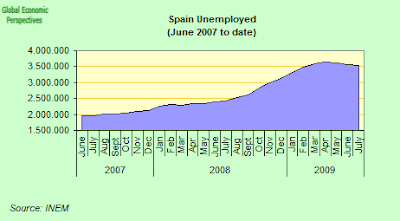 So the fact of the matter is, that the latest good data we have for Spain are the June unemployment data (supplied to Eurostat based on the EPA) which showed 4.186 million out of work, and an unemployment rate of 18.1%. 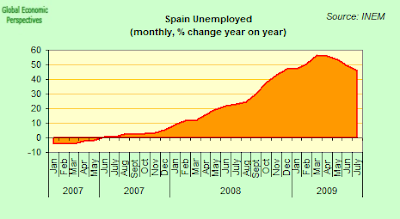 And unemployment is rising every month, and that is the sorry and woeful tale of Spanish unemployment at the moment. That and my forecast that, if nothing is done to stop the runaway contraction, unemployment could be up and hitting the 30% mark come December 2010. 25% before Easter 2010 is now a done deal as far as I am concerned, and we will probably break the 20% psychological threshold in October or November of this year. "The banking sector in South Africa has insubstantial leverage and did not enter in to excessively risky lending practices that were the hallmarks of the credit-boom days. However, South Africa’s Current Account Deficit remains wide and its ability to service its short-term debt is on the wrong side of comfortable. These factors, along with the size of the banking sector in relation to that of other emerging markets, would bring unwelcome attention to the economy in the event of a deterioration of global risk sentiment (perhaps precipitated by a sovereign debt crisis elsewhere in the world)." As was expected by most analysts, South Africa's GDP shrank in the second quarter of this year at an annualised rate (q/q saar) of 3% over the first quarter (which represents an actual seasonally adjusted shrinkage of 0.75%) as comparted to the 6.4% rate (1.6% actual) seen in the first three months of the year. The improvement in GDP was largely due to better performance in mining, manufacturing and the energy sector. 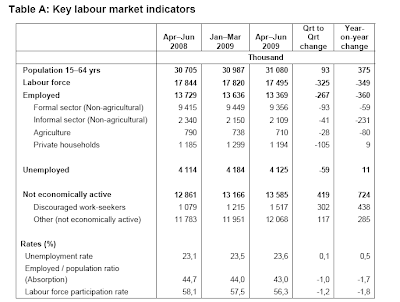 Activity declined 2.8% year on year from the 1.3% drop recorded in Q1 2009. Agriculture was a serious disappointment, with a 17% (q/q saar) from a 2%(q/q saar) drop in Q1. Evidently the pace of decline is easing, manily due to expansionary fiscal measures and an increasingly accommodative monetary policy and in part to the impact of what have become colloquially known as global green shoots (that is demand stimulus from other countries). The figure is unlikely to significantly influence interest rate decisions next going foward as it was broadly in line with consensus expectations, and was effectively factored in at the last RBSA monetary policy meeting. Going forward, downside surprises on inflation and continued weakness on real economy could potentially lead the Reserve Bank to further reduce interest rates. 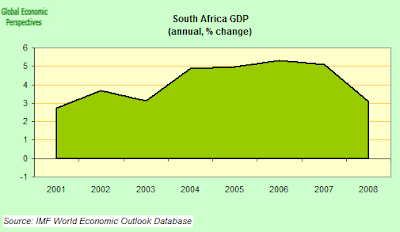 South Africa's economic performance has steadily been strengthening recent years, with real GDP growing at an annual average rate of 4.6 percent in the years between 2005 and 2008. Inflation had declined to mid-single digits and employment had been growing steadily. Growth in recent years has been driven by strong domestic demand, with private consumption and investment spending supported by robust consumer and business sentiment. Household consumption was also boosted by growing disposable income, rising employment, and wealth effects from rising asset prices until late 2007. However, 2008 saw a slowdown in activity reflecting the cumulative impact of electricity power shortages, the global slowdown, and a policy of monetary tightening. 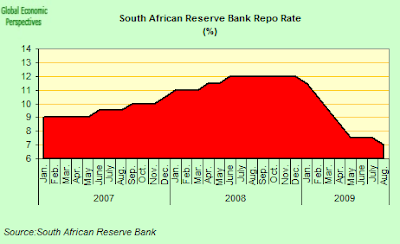 Real GDP growth slowed to 3 percent as the country entered recession.The deceleration in the pace of growth is clearly seen in the in the evolution of the Reserve Banks preferred measure of money supply (M3, see chart below which comes from the RBSA) with increases slowing sunstantially after Q4 2007, but with the slowdown clearly deepening in early 2009. 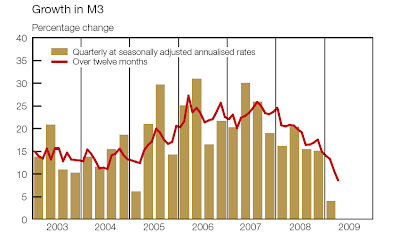 Twelve-month growth in M3 decelerated from 14.8 per cent in December 2008 to 10.6 per cent in March 2009 and further to 8,5 per cent in April. On a quarter-to-quarter3 basis, M3 growth amounted to 4,1 per cent in the first quarter of 2009; down from 15,1 per cent in the fourth quarter of 2008. Comparing this year's first half with that of last year, the economy is down only 2%. It is expected to stabilise next quarter, and move back into growth by the fourth quarter, making it unlikely that the full-year decline will be as bad as the 2% plus that more pessimistic economists had predicted. Excluding the volatile agriculture and mining sectors the economy actually improved by as much as four percentage points to minus 2.4% in the second quarter from minus 6.2% in the first quarter. Construction, government and personal services (such as healthcare) carried what growth there was, and export-oriented sectors of mining and manufacturing did better than in the previous quarter. But the big disappointment was the retail and wholesale trade sector, which did far worse than expected and the decline accelerated to 4.5% in the second quarter from 2,5% in the first. The manufacturing sector continued to contract in the second quarter, but the 10.9% drop should be seen against the first quarter's steep slump of 22%. The financial sector also contracted again, by about 2.5%. Mining expanded 5,5% after the first quarter's 32% fall as it started to benefit from better commodity prices. 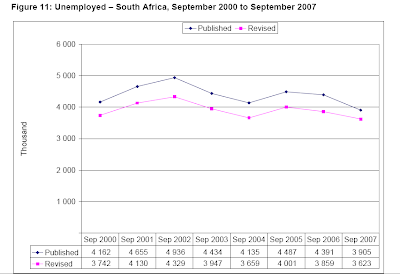 South Africa's unemployment rate increased very slightly - to 23.6% in the second quarter from 23.5% in the first quarter of 2009 - what is perhaps surprising is that this was despite the fact that 267 000 lost their jobs during the quarter. Part of the explanation for this is that the number of discouraged work seekers rose by 302 000. Had that number been added to the unemployment total, the result would have been an unemployment rate of more like 29.7% (compared to an equivalent calculation of 28.4% in Q1 2009). Most importantly, the latest rise takes the total number of discouraged workers to 1.5 million from 1.1 million in Q2 2008. As a result the number of people who are not economically active in the working age range increased to 13.58 million, from 12.86 million in Q2 2008 with the consequence that the economically inactive population, of which discouraged workers form 11.2%, is currently larger the employed workforce and almost one and-a-half times the size of those in formal employment. 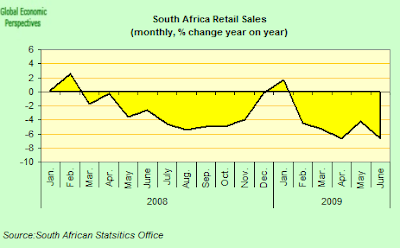 Price adjusted retail sales decreased in June by an annual 6.7% following a 4.4% drop in May. 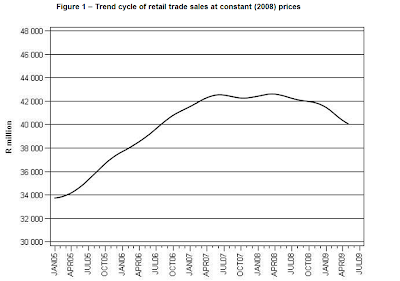 For the three months to June, sales contracted by 6% relative to the corresponding period a year earlier . Anxiety about job security, comparatively high levels of household debt, still high inflation which is still relatively high and a low level of consumer confidence are the likely reasons for the negative growth in real retail sales and this may well continuer for most of 2009. Ultimately declining interest rates, lower inflation and improved household balance sheets should see a recovery in retail sales in early 2010. The household debt-to-disposable income ratio continued to rise in the first three months of the year - if only marginally to 76.7% from 76.3% in the last quarter of 2008 - implying that financial strain on households remained significant. Debt consolidation should gain traction during the second half of the year, when the debt service cost-to-income ratio falls to around 8% from its current level of 10.9%, at the same time as lower inflation frees up some additional cash in the household sector. Although the final result was not as bad as many expected, manufacturing production still fell by an annual 17.1% in June, little changed from the downwardly revised 17.2% contraction in May. South African industry still appears to be in the throes of an inventory stockpiles rundown. Iron and steel were down 24.3%, the automotive sector 32.8%, and petroleum and chemicals were down 14.7% . Output did increase by a miniscule 0.1% seasonally adjusted setween May and June, but more to the point the rate of contraction in production did slow down significantly in the second quarter, showing minus 3% q/q s.a. as compared wuth minus 6.9% q/q s.a. in Q1. 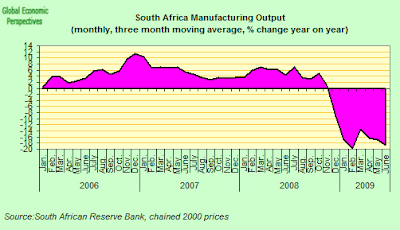 Encouragingly, electricity consumption, often a useful indicator of economic activity, rose in June by 1% over may (s.a.) and by 2.9% (s.a.) in Q2 over Q1, which would seem to confirm that the recession eased markedly in Q2. The latest manufacturing purchasing managers index reading, however, did not give as much grounds for optimism as might have been hoped for, since the PMI weakened in July to 37.3 from 37.9 in June following two consecutive monthly gains, suggesting the rate of contraction in manufacturing activity accelerated again, even if only slightly. The weakening was pretty broadbased, with business activity, new sales orders, suppliers performances and input prices falling in the month. In fact South Africa’s manufacturing PMI seems to be lagging the PMIs of the country's major exporting partners (US, Germany, Japan and UK) by two-to-six months. 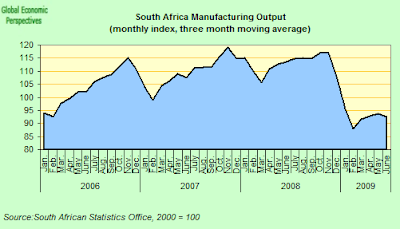 While these economies reached the troughs in their PMIs between November 2008 and February 2009, their PMIs have rebounded nearly seven times as much as the South Africa one, since hitting their respective troughs. This suggests that by October the decline in production could be over and out of the system, provided that is that the slow but steady recovery in the three above mentioned economies continues, which is far from guaranteed. 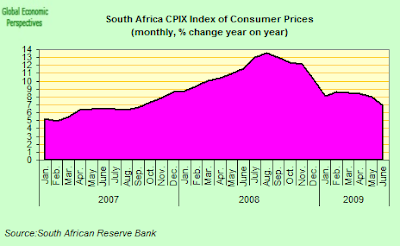 The inflation measure targeted by the South African Reserve Bank until the end of 2008 was the consumer price index excluding mortgage interest costs for metropolitan and other urban areas (CPIX). The year-on-year inflation rate as measured by CPIX peaked at 13.6 per cent in August 2008 and then declined continuously to 10.3 per cent in December. According to the central bank the main drivers of inflation during the last quarter of 2008 were food prices, fuel and power (electricity prices), and transport (petrol prices). 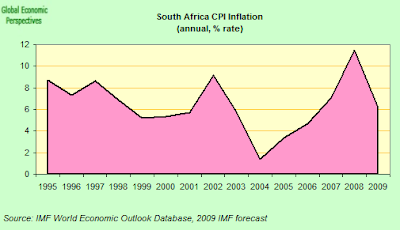 Average CPIX inflation for the calendar year 2008 was 11.3 per cent. Since the release of the January 2009 CPI data, the targeted inflation measure has been the headline CPI (CPI for all urban areas). This new CPI includes a number of changes of methodology when compared to the previous CPI. The year-on-year CPI inflation rate was 8. 1 per cent in January 2009. It then rose to 8.6 per cent in February before declining marginally to 8.5 per cent in March (Figure 1). Inflation in the first quarter of the year was driven mainly by increases in food prices, alcoholic beverages, household maintenance and repair, electricity, and in financial services. Since that time the inflation rate has fallen back slightly - from 8.0 per cent in May 2009 to 6.9 per cent in June - but given the extended recession and the low levels of capacity utilisation this rate is still noteworthy for its size. One of the underlying problems is evidently still the rate of administered price inflation, which (excluding petrol prices) was running at 9.1 per cent in June, with electricity prices increasing by 28.6 per cent. 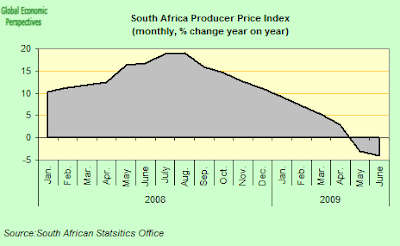 Producer prices, on the other hand, do show the impavt of the fall in energy prices and the economic slowdown, since they declined at a year-on-year rate of 4.1 per cent in June, compared with a decline of 3.0 per cent in May. Prices of mining and chemical products were the main contributors to this trend, but there was also further moderation in food price inflation. Basically, having headline CPI inflation still running at 6.9 percent is something of a headache for the central bank, since given the recession they would evidently like to ease more (which would also help take some of the upward momentum out of the Rand), but the bank will be wary of going too far, given the extent to which its credibility will be under test. South Africa’s central bank unexpectedly cut its benchmark interest rate by half a percentage point, the sixth reduction since December, to curtail the economy’s first recession in 17 years. The repurchase rate was lowered to 7 percent. Governor Tito Mboweni said in a televised statement after the monetary policy meeting that the decision to reduce rates had been a “very closely debated one”, and it seems unlikely that further rate cuts will follow rapidly. The problem is that the central bank is on the horns of a real and very important dilema here, as it struggles to apply text book inflation targeting monetary policy in times which are most definitely not of the text book variety. 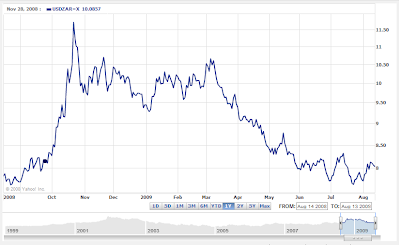 One of the issues is that interest rates which are set high to contain inflation can often have the perverse effect of attracting fund flows which are drawn by the yield differential, and the expectation of further currency appreciation (among other things South Africa's is a commodity producing economy) - and the swift reversal of the fund outflows witnessed last winter (see chart below) gives some hint that this kind of counter intuitive effect may now be at work in South Africa. Thus South Africa’s rand, despite the current severe recession, has in fact been the second best-performing currency, after Brazil, across the globe this year. But is this impressive performance of the ZAR supported by the underlying macro fundamentals? Negative growth, depressed confidence and steadily rising unemployment certainly do not make it look like it is. The rand appreciated the most in a month against the dollar last week - maintaining its first weekly advance since July 24 - on the back of consensus feeling the global economy is moving out of recession, increasing appetite for high-yielding assets. On Friday (August 21) the currency strengthened by as much as 1.9 percent to 7.7474 per dollar, its biggest intraday jump since July 20 and best level since Aug. 4. It was up 1.1 percent at 7.8139 per dollar as of 5:06 p.m. in Johannesburg, for an increase of 3.4 percent over the week. The rand has now climbed 21 percent against the dollar this year as benchmark interest rates fell to near zero in the U.S. and Europe compared with 7 percent in South Africa, making the South African currency a favorite for the so called carry-trades where investors borrow money in countries with low interest rates to invest in markets with higher returns. The rand offered the third-best carry-trade return of the 16 major currencies monitored by Bloomberg last week. Much of the ZAR move has been closely correlated with the return of investor risk appetite. One of the main catalysts for this has been the upside surprise from US economic data (as Varinat Perception's Simpon White put it the second derivative of the data turned positive while the second derivative of the consensus estimates remained in negative territory). 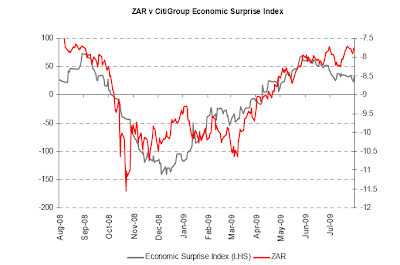 Unsurprisingly, as Simon points out, there is a very good fit between ZAR and the Citigroup US Economic Surprise Index (this measures the degree of "surprise" in the data releases). This close relationship simply serves to emphasise the seductive power of emerging markets to investors – now wallowing in liquidity. In fact the ZAR has moved more closely with unexpectedly good US economic data than either the S&P or US 10y Treasury yields. This liquidity-driven geared-play on emerging markets is now a central part of the global recovery. A softening attitude to the prognosis for the South African economy is also reflected in risk spreads. Sovereign CDS continues to fall, approaching levels seen last summer, and the spread between South African and US 10y Treasury yields has returned to its average over the period late 2007 to the present. The stock market has also bounced back, and is so far up 36% from the trough. With the rally in equity markets that began on the 6th of March this year and on the 13th of July continued with renewed vigour, money inflows to South Africa began to recover after a sharp rout in the fourth quarter of 2008. 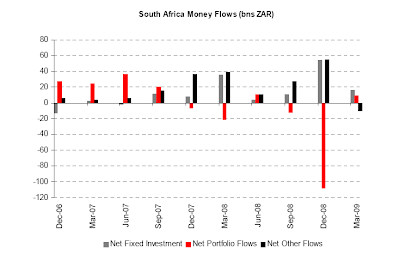 In fact there was huge net outflow of portfolio flows in Q4 2008 which quickly reverted to a net inflow in Q1 2009. 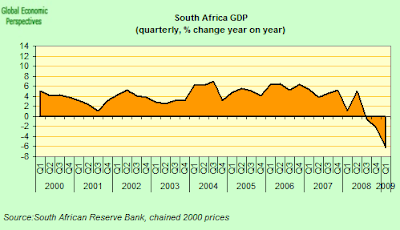 The current account deficit as a whole – perennially wide in South Africa - narrowed from a low of -8.8% of GDP last March to -5.8% in the last quarter of 2008, driven in part by falling import prices (primarily oil). More recently the deficit has widened again due to mining and manufacturing exports falling faster then imports. Further widening in the current account deficit from this source will likely be limited as the trade balance has recently improved somewhat (but due to falling demand for imports rather than an increase in export trade). On the positive side, the composition of South Africa’s relatively large current account deficit looks healthier than in previous years as net foreign direct investment has improved dramatically: it was over 100bn ZAR in 2008 compared to an average of close to zero in the preceding 3 years. With almost half of South Africa's goods exports destined for the US, Europe and Japan, the recession in the developed economies has naturally severely affected South Africa's trade performance. 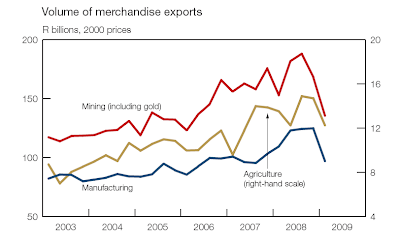 But with the real effective exchange rate of the rand also increasing - according to central bank data it was up by 4.9 percent between March 2008 and March 2009 - then evidently South Africa's exporters are facing a price competitiveness problem. So it is no surprise to find that the volume of goods exports was down at a 21 percent annualised rate in the first three months of 2009, and this on the back of a decrease of 6.3 per cent in the fourth quarter of 2008. Relative to real gross domestic product, the value of goods exports dropped from 20.8 per cent to 16.7 per cent during the first quarter. Although declines were noted in all major export categories, the decrease in the volume of manufactured exports was strongly related to the sharp contraction in manufacturing activity among SA's most important trading partner countries. In addition, the deceleration in the Chinese demand for raw materials used in production processes had a negative impact on South African mining products. As a result, it is understandable that the country's goods trade deficit was widening - from R19,6 billion in the fourth quarter of 2008 to R53,4 billion in the first quarter of 2009. A trade deficit of similar magnitude was last recorded in the first quarter of 2008 as a result of the fact that the country experienced severe power outages. South Africa’s government is no so concerned about the situation that Economic Development Minister Ebrahim Patel warned last week that the current recession might irreparably erode the country’s manufacturing capacity. All of which naturally enough feeds directly through to the pretty substantial current acount deficit. Credit growth in the private sector has slowed subtantially, and while it still remains positive, it has now dropped from a 20.3 percent in the year ending in June 2008, to more like a 5% annual rate of increase in June 2009. Household debt rose slightly to a record level of 78.25 percent of disposable income by the first quarter of 2009. Pushed mainly by rising interest rates, household debt service has risen to about 11.25 percent of disposable income, but remains below historic highs. 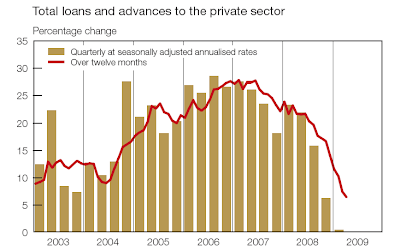 Total loans and advances extended to the private sector continued to decelerate in the first quarter of 2009. The deceleration was partly a consequence of the decline in income and deteriorating outlook for economic activity, restrictive credit conditions and the cumulative effect of the tighter monetary policy stance introduced since 2006. Growth over twelve months in total loans and advances extended to the private sector decelerated from 14.0 per cent in December 2008 to 7.3 per cent in March 2009, and further to 6.3 per cent in April. The annualised quarterly growth fell from 6.2 per cent in the final quarter of 2008 to a mere 0.1 per cent in the first quarter of 2009 – the lowest rate since the first quarter of 1966, when this rate was negative. Adjusted for inflation, loans and advances fave contracted significantly in recent quarters. With the exception of mortgage advances, all the other main credit categories contracted in the first quarter of 2009. Mortgage advances, which comprise about 52 per cent of total loans and advances, continued to rise, but their twelve-month growth rate decelerated from 13,2 per cent in December 2008 to 11,3 per cent in March 2009 and further to 10,6 per cent in April as stricter lending criteria and higher deposit requirements by the banking sector continued to dampen mortgage business, especially residential mortgages. Not surprisingly, given the economic and credit environment, South African house prices have been falling, and were down 4.2 percent in July from a year earlier, according to Absa Group Ltd., the country’s biggest mortgage lender. The average nominal house price dropped to 925,100 rand ($115,548). Prices fell 0.2 percent in the month, after declining 0.4 percent in June. After gaining 3.7 percent in 2008, house prices will probably fall between 3 percent and 3.5 percent this year, according to the Absa Group forecast. Twelve-month growth in instalment sale and leasing finance has also slowed noticeably and showed negative growth of 0.2 per cent in April 2009, largely reflecting the slump in sales of motor vehicles and other durable goods. Other loans and advances contracted for the second consecutive quarter in Q2. Twelve-month growth in other loans and advances decelerated from 17.9 per cent in December 2008 to 3.9 per cent in March 2009 and further to 2.8 per cent in April. 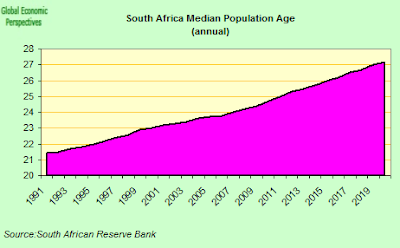 Demographic processes are now very favourable to South Africa, as fertility declines, and the mdeian age of the population steadily rises, and more and more of the population are to be found in the working age ranges. This creates the favourable situation where the country can reap the benefits of what is known as the "demographic dividend", as the percentage of dependent population steadily falls. However, this process puts enormous pressure on the labour market, as more and more young people enter looking for work. 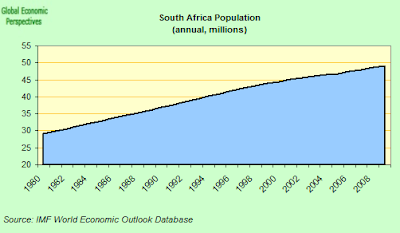 As can be seen in the chart below, South Africa's working age population is increasing at a rate of 375,000 a year, or nearly 100,000 a quarter. That is a lot of jobs to find. But, as we can see in the next chart, due to the recession employment actually fell between Q4 2008 and Q1 2009, while over the course of Q2 2009 it more or less moved sideways. Little wonder there is such a large problem of "discouraged workers". At the same time there will be growing pressure on the fiscal side. South Africa’s borrowing needs are likely to be double the government’s projection according to estimates from JPMorgan Chase & Co. They suggest government borrowing may surge to 183 billion rand ($22.4 billion) in the 2009-10 fiscal year to cover spending, compared with the forecast of 90.37 billion rand outlined in its February budget. If confirmed this would increase the budget deficit to 7.4 percent of gross domestic product, compared with a government forecast of 3.8 percent, she wrote. The national government fiscal balance moved into surplus (0.9 percent of GDP) in the financial year 2007/08, bringing the total government debt level down to around 28 percent of GDP. The surplus, the second in a row, reflected a large increase in tax revenue, owing to strong economic activity over most of the period and continued collection efforts. Total public debt, including obligations of public enterprises and local governments, dropped to about 35 percent of GDP. Sonja Keller estimates that South Africa is likely to miss its 643 billion rand revenue-collection target by between 75 billion rand and 80 billion rand in the current fiscal year (forecasting the economy to shrink by 2 percent). Some confirmation of her view can be found in a recent statement of Finance Minister Pravin Gordhan, who admitted the government may miss its target by as much as 60 billion rand this year. Pressure on public finances may come from higher wage settlements in the public sector, since civil servants look set to push government expenditure above the budgeted 738.6 billion rand by about 10 to 15 billion rand. South Africa’s government granted a 13 percent wage increase to about 125,000 striking municipal workers on July 31 to end a wage dispute. 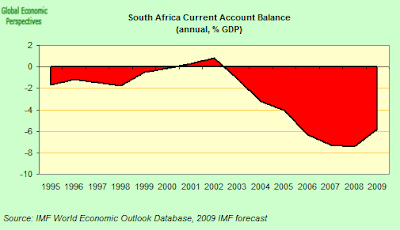 1) The current account deficit. 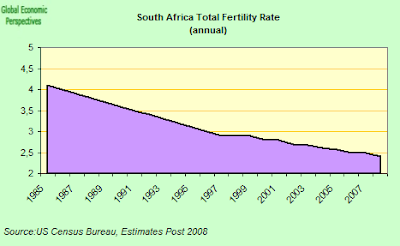 4) The serious structural distortion which can be produced in South Africa's industrial and economic development by the kind of strong geering-related liquidity play to which the country is currently being subjected by the financial markets, since this is producing substantial distortions in relative pricing and in the country's real effective exchange rate, a factor which is critical for those contemplating long term serious greenfield site invement projects. Is Germany's Economy Really Powering Ahead? Well, euphoria in Germany is certainly on the rebound, with a sudden surge in the ZEW investor confidence index and newspaper articles all over the place predicting the imminent renaissance of European economic growth, despite the fact that in 3 of the 5 big European economies - the UK, Italy and Spain - there is little in the way of evidence to back this view up. The French economy is certainly holding up reasonably well, but the situation in Germany still remains deeply problematic due to the complete dependence of the economy on exports. Despite this we have a shower of articles (Below I present an extract from Frank Atkins writing in the Financial Times) explaining how "Europe's Economic Recovery is Gaining Steam" and the "German economic recovery powers ahead". 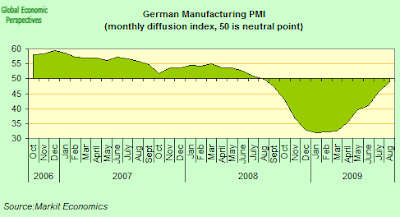 I have already written up a an extensive summary of the actual state of play in the German economy, which is largely supported by a strong government stimulus programme, and a recovery in industrial output for export to levels which are more in line with the actual current level of demand than were the extremely low levels seen at the turn of the year (which were the product of demand being met from inventory run downs). The purchasing managers’ index for Europe’s largest economy jumped to 54.2 in August, from 49.0 in July, signalling an unexpectedly brisk pace of expansion. The growth was driven by the service sector, where employment actually rose, but manufacturing also showed a further rebound. The figures were the latest economic data from continental Europe to surprise on the upside and suggested the region had overtaken the US and UK in the pace of its recovery. France’s economy is also now expanding clearly, according to a separate purchasing managers’ index for the eurozone’s second largest economy. Germany’s rebound appears to have been powered by the country’s pioneering “cash-for-clunkers” incentives for new cars purchases and a pick-up in global demand for its exports. Earlier this week, the Bundesbank reported that consumer spending was likely to have risen further in the second quarter and described German shoppers as “remarkable in continuing to defy the negative effects of the global economic and financial crisis”. The Bundesbank argued that a “further marked pick-up in overall economic output is possible in the third quarter”. However, Axel Weber, Bundesbank president, has sought to rein in expectations, warning in a German newspaper interview this week that “the economy is not yet standing on its own feet, and the financial markets are still reliant on central bank help”. Other European Central Bank policymakers have also warned that a self-sustaining recovery may take longer to emerge – which also suggested the ECB will be in no rush to reverse the exceptional steps it took to combat the eurozone’s recession. Evidently Frank Atkins is right up to a point (and his position may indeed even seem more extreme than it is due to poor headline writing). 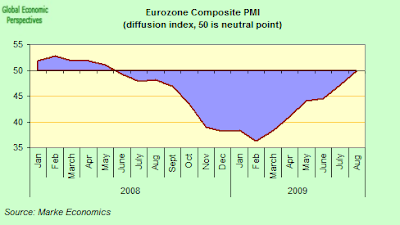 It is certainly the case Europe's economies continued to show signs of improvement in August - following a better than anticipated perforemance in Q2 - with the Markit Flash Eurozone Composite Output Index rising to 50 from 47 in July, thus ending a fourteen-month sequence below the no-change mark of 50. The Flash Purchasing Managers Index for the manufacturing sector stood at a 14-month high of 47.9 in August compared to 46.3 in July, while the services PMI rose to a 15-month high of 49.5 versus 45.7 in July. Markit only publishes flash readings for two eurozone economies, France and Germany. PMI readings give us the best up to the moment snapshot of where activity is at at any given point. 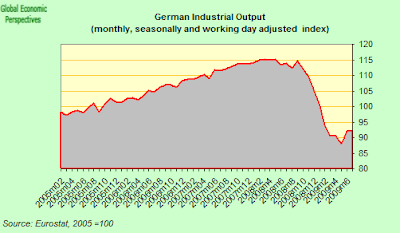 The Markit Flash Germany Composite Output Index stood at 54.2 in August, which was the highest reading for fifteen months, following an index reading of 49 for July. 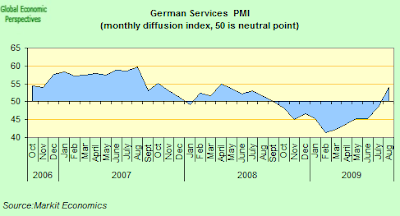 The German Flash services PMI rose to 54.1 in August from 48.1 last month. A very strong rebound for a single month, but do watch out, since elections are coming, and beyond that tricky little data point there is no evident explanation for this impressive rebound. It is suspicious for its strength, in what is an otherwise tepid environment. Whilet he Flash Manufacturing PMI moved up to 49 from 45.7. A solid improvement, but we are still just short of expansion. So obviously we should also take into account the latest PMI readings for the Eurozone, which were certainly positive, but hardly sufficient to start uncorking the champagne bottles. Basically, I would note two more things about the recent German performance. i) We are in the direct run up to an election. This phenomenon has well known side effects for public spending etc. Certainly every project which can be will be being brought forward at this point. We need to wait and see what things look like in October before drawing too many conclusions. "As reported by the Federal Statistical Office (Destatis), the core budgets of the Federation and the Länder – as defined in public finance statistics – recorded a considerable financial deficit in cash terms in the first half of 2009. For the Länder, the financial deficit totalled EUR 15.4 billion, while in the first half of 2008 a financial surplus of EUR 3.1 billion was recorded. In the core budget of the Federation, the financial deficit rose to EUR 14.7 billion compared to EUR 13.1 billion in the first half of 2008. It should be noted, however, that the financial burdens of the Federation caused by the financial and economic crisis become obvious mainly in its extra budgets “Financial Market Stabilisation Fund” and “Investment and Redemption Fund”. Relevant statistical data will not be available until the end of September." Please note that last little line - "Relevant statistical data will not be available until the end of September." - ie after the elections which will be held on 27 September. ii) Bundesbank president Axel Weber may be over optimistic when it comes to the deflation threat, but he is far from being full of "irrational exhuberance" about the present timid bout of growth. This kind of view, however, is seldom reflected in those attention grabbing headlines. It would be a pity if all this new found German growth, like those famous wave of babies who were supposed to have been being born in Dussledorf last year, should turn out just to be a blip, undetectable when the annual figures are counted up. Indeed the present situation (even down to the headlines) is very reminiscent of the reaction after the first quarter of 2008, when that famous decoupling thesis was first launched in all its splendour, which is why I am reproducing extracts from an article by Karl Zawadzky written at the time. He said then "the indicators suggest that the German government is on the safe side with its growth prediction of 1.7 percent. Some economic experts are already speaking of 2 percent or more." In fact German GDP started shrinking almost immediately after the words were written and 2008 whole year growth came in at only 1.3% according to the Federal Statistics Office (and more like 1% on a calendar adjusted basis, allowing for the extra day in February) as I was already more or less forecasting in July 2008 (just for those of you who think economists never get anything right). My feeling is that by the time we get to the end of the third quarter of 2009 we will all be back to reality, including those among us who write newspaper headlines. The German economy surged in the first quarter of this year, defying a global slowdown. DW's Karl Zawadzky remains optimistic about Germany's ability of maintaining its current financial boom. Experts are predicting that economic growth will slip this year. They cite the financial crisis, high oil and gas prices and the expensive euro. 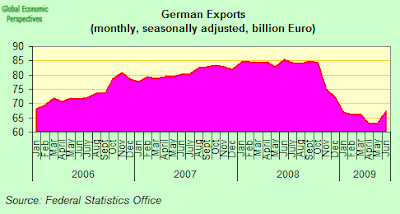 But the German economy is currently quite robust -- perhaps even more robust than many experts think. The surprisingly strong jump in economic activity during the first quarter is evidence of this. While gross domestic product increased by only 0.3 percent in October, November and December, it rose by 1.5 percent in the first three months of 2008. For years, business activity has been fuelled by ever increasing export records. But now, focus has shifted to domestic markets. There were few impulses from abroad that spurred the German economy during the first quarter. The rising prices of key imports crude oil and gas, but also the expensive euro, which put the breaks on German exports, played a decisive role. 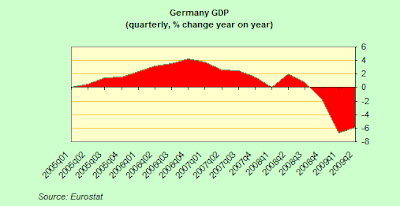 But the German economy is still on track for growth. Even in the first quarter, personal consumption rose after many weak years. Employment was up 1.8 percent compared to spring 2007 and the rise in wages in some sectors promises the biggest increase in buying power in years. That will boost consumption. The German economy is powering ahead, propelled by its own strength. The indicators suggest that the German government is on the safe side with its growth prediction of 1.7 percent. Some economic experts are already speaking of 2 percent or more. Compared to other countries in the EU, Germany is proving to be the bloc's economic engine and is powering through the current financial crisis quite well. While the German economy grew by 1.5 percent in the first quarter, the EU reported an average growth rate of only 0.7 percent. 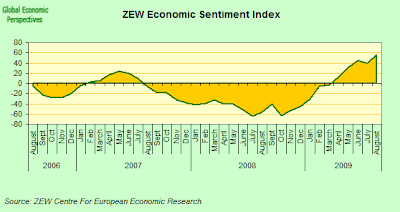 Certainly German analyst and investor sentiment rose sharply in August to its highest level in over three years. The ZEW economic think tank's closely-watched monthly survey, said rising industrial orders and a pick-up in exports had brightened the outlook for Germany. The Mannheim-based institute's economic expectations index for Germany rose to 56.1 in August from 39.5 in July, taking the indicator to its highest level since April 2006. But we should never forget that while German exports swang back to solid growth in June, surging by 7 per cent in June, optimism was also boosted by a 4.5 per cent rise in industrial orders in June - powered almost entirely by export orders - they are still significantly down on the level they attained one year ago. While industrial production output numbers for June, tempered hopes for a further rebound, since they fell back 0.1 per cent compared with the May’s figures which showed a 4.3 per cent rise over April. 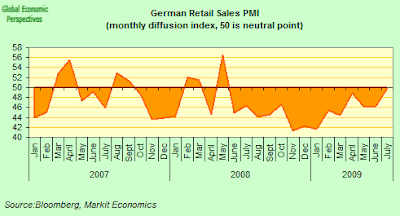 And in terms of domestic consumption it really is difficult to see any powering ahead in German retail sales, since while the rate of decline may have eased somewhat in July as only a marginal drop was shown in month-on-month sales (the index rose from 46.0 in June to 49.8) the index has now been registering contraction since sales began falling in June of last year. And I doubt things are going to get much better on this front anytime soon. Oh, and one last little detail. Germany's economy is not - as Frank Atkins again had it in last Friday's FT - offering a ray of hope for the global economy, since Germany is running a current account and trade surplus, which is to say that, on aggregate it is actually draining demand from the rest of the world, rather like those famous energy inefficient solar panels, it uses up more energy producing itself than it actually supplies. "Japan returned to growth in the second quarter after a year of contraction, but economists warned that the recovery remained vulnerable to any faltering in export demand or tightening of the government’s fiscal stimulus spigot........Yet with unemployment still rising and deflationary pressures growing, Japanese Prime Minister Taro Aso acknowledged the world’s second-largest economy was still far from a return to real health. “We are only halfway there,” the prime minister said during a pre-election debate with rival party leaders." Japan’s 3.7 percent economic expansion last quarter ended the country’s worst postwar recession. The bounce may be as good as it gets. Growth will slow to an annual 2.9 percent pace in the three months ending Sept. 30, according to the median forecast of 10 economists surveyed after yesterday’s gross domestic product report. Falling business investment and rising unemployment may hamper a recovery that has been fueled by $2.2 trillion in emergency spending by governments worldwide. Exports, and public investment were the main growth drivers in Japan this quarter, while private consumption remained notably weak. The principal impetus came from exports that jumped 6.6 percent (quarter on quarter), led by demand from China. At home, Taro Aso’s 25 trillion yen ($264 billion) in stimulus helped consumer spending rise 0.8 percent on the quarter and lead government investment to climb 8.1 percent. The figures evidently show hallmark of a worldwide rebound in factory demand (after inventories have been run down) and large-scale economic stimulus measures in Japan. The expansion in exports, benefits from economic stimulus measures, and inventory building are unlikely to continue, and growth will most likely slow again, especially after the last quarter of this year, as their impact fades. Deflation will remain a feature of the Japanese economy and I thus expect the BOJ to maintain its policy of monetary easing into the indefinite future. 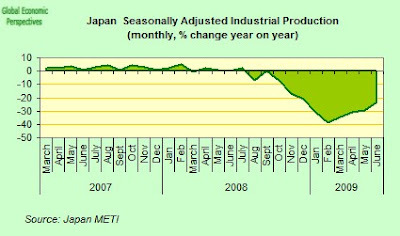 Personally I do not expect to see anything resembling a full-fledged recovery in Japan until the second half of 2010, although the present slight expansion phase may well continue through the July to September quarter, and certainly the July PMI suggested this. (1) fading support from economic stimulus measures, especially after the elections, when the deteriorating fiscal situation will need to be addressed. (3) downward pressure from household spending as employment adjustments have an effect. Japanese industrial output rose for the fourth month in a row in June and is expected to keep climbing as manufacturers restart production lines halted during the highpoint of the slump. June industrial production was up 2.4 per cent month-on-month, a rate of increase lower than the revised 5.7 per cent growth recorded for May but still an increase. It is now obvious that the drastic output cuts of the last quarter of 2008 and first quarter of this year have successfully cleared the excess inventory backlog despite the extraordinary speed at which demand declined. The Industry and Trade Ministry (Meti) reported that inventories were down 1.0 per cent month-on-month in June, while the inventory ratio - which compares inventory to actual shipments and is seen as a leading indicator - was down 9.8 per cent. This the sharp fall in the inventory ratio suggests that the driveing force behind the current production growth has shifted from excessive inventory reduction to responding to overseas and domestic demand fuelled by government stimulus policies across the globe. July PMI survey data provided further evidence that Japan’s manufacturing sector may continue to sustain the economy into the next quarter. 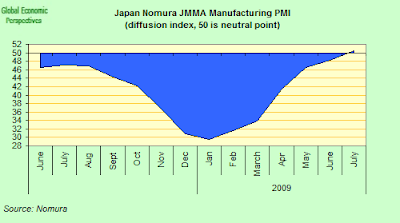 The seasonally adjusted headline Nomura/JMMA Purchasing Managers’ Index (PMI) rose to 50.4 in July, from 48.2 in the previous month, pointing to the first improvement in operating conditions for seventeen months. Although only marginal, growth of the sector was slightly faster than the survey’s historical average. Manufacturing production increased for the second month running in July, rising at the most marked pace since September 2006. Where an expansion of output was signalled, PMI survey panellists frequently linked this to renewed growth of new orders. It was the first improvement in firms’ order books for seventeen months. Those respondents that reported a rise in new order levels widely attributed this to firmer demand from home and overseas, with export sales rising for the second month in a row. The survey organisers stated that anecdotal evidence suggested improved demand from China was providing the main boost to workloads at manufacturers. The shortfall in demand is already weighing on prices, making it likely that deflation will once again become entrenched in the economy. Consumer prices plunged a record 1.7 percent in June and yesterday's GDP report showed wages fell a record 4.7 percent from a year earlier. Capital spending, which accounts for about 15 percent of the economy, fell 4.3 percent last quarter. A survey published this month by the Development Bank of Japan showed companies expect to cut fixed investment 9.2 percent this fiscal year. Reductions by manufacturers will be the steepest since 1993. 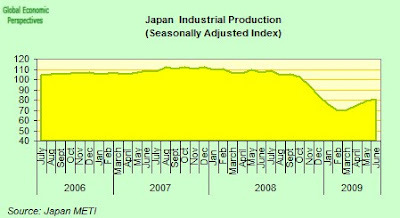 While the falling energy prices that have been the main driver behind the decline in the consumer price index to date, deepening deflation fuelled by job insecurity and massive manufacturing over-capacity could become a major feature of the Japanese economic environment and effectively undermine the economic recovery process. The fall in "core-core" consumer prices, which exclude both food and energy, accelerated to 0.7 per cent in June, while more recent July price data for urban areas of Tokyo showed a fall of 1.1 per cent. Japan’s unemployment rate rose to a six-year high in June and consumer prices fell at a record pace, adding to evidence the domestic economy is struggling to recover even as exports start to improve. The jobless rate advanced to 5.4 percent from 5.2 percent in May, the statistics bureau said today in Tokyo, higher than the 5.3 percent median forecast of economists surveyed. Economists expect the jobless rate to rise to a record 5.8 percent as companies cut costs. Deflation may erode profits even as factory output rebounds, further hampering Japan’s recovery from its deepest postwar recession. In addition there is the so called "hidden unemployment" problem - employees retained by Japanese companies who are effectively surplus to current needs. A recent study by analysts at Nomura found that when indexing the number of those employed and real GDP to the output peak of Q4 2007 the result showed a considerable gap. Based on a simple calculation and assuming this gap to represent the amount of “hidden underemployment”, they arrive at a figure for “hidden jobless” in Q1 2009 of 4.7m. This is far higher than the June unemployment figure of 3.48m. If the hidden jobless are included together with the registered “unemployed”, they calculate that the unemployment rate would leap from 5.4% to 12.2%. Japan’s household sentiment rose for a seventh month in July, adding to signs the world’s second- largest economy is edging closer to a recovery. 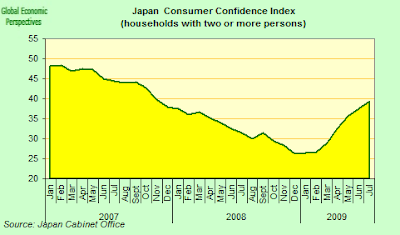 The confidence index climbed to 39.4 from 37.6 in June, the Cabinet Office said today in Tokyo. It has improved every month since tumbling to a record low of 26.2 in December. A number below 50 means pessimists outnumber optimists. 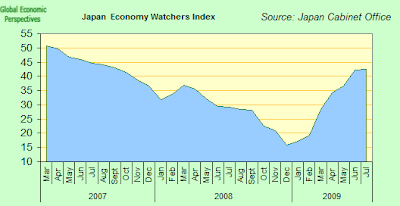 The Economy Watchers index, a survey of barbers, taxi drivers and other small businesses who deal directly with consumers, climbed to 42.4 from 42.2 in June, making for a seventh monthly increase. So despite the sigh of relief that everyone must have gasped on seeing the growth number for the second quarter, it is obvious that Japan's problems are far from over. Unemployment - with or without the hidden variety - is going to remain a problem, and the consensus view among economists expects the unemployment rate to climb to an unprecedented 5.9 percent by next year. On the other hand real wages continue to fall, sliding by 5.2 percent in June from a year earlier, the fastest decline on record. And while the Bank of Japan this month announced that economic conditions had “stopped worsening”, it also highlighted doubts about the robustness of recovery by predicting the contraction in the fiscal year would be greater than previously forecast. The BoJ now expects gross domestic product to contract 3.4 per cent in the year to March 2010. Bank of Japan Governor Masaaki Shirakawa stresssed that demand for the country’s products and services may well not gain momentum. It is now highly likely that the next central bank inflation forecast will predict that deflation will extend into 2011, which will force them to prolong their policy of keeping rates near zero for some considerable time. Shirakawa himself has admitted that prices are falling worldwide because of a dearth of demand and excess supply in the wake of the global economic crisis, adding that it will take “considerable time” before price drops moderate. On top of this there is continuing political uncertainty. Opinion polls show the ruling Liberal Democratic Party is likely to lose the lower house election to the opposition Democratic Party of Japan, which has never held power before. The DPJ has made considerable promises to the Japanese electorate for spending increases, but it is unclear how they will, in fact react give the very strong constraints on public spending which actually now exist. On thing. however, is certain: if they do win the coming elections they will inherit an economy which even after last quarter’s expansion is still at its 2004 level. Is This Really a Global Recovery?